Over the course of two Schooner soaked nights at Halifax’s Gus’ Pub in the winter of 2007, journeying song and dance man B.A. Johnston gathered friends, fans and a film crew to help celebrate his birthday. Playing alongside a variety of the region’s most renowned acts, the event’s proceedings were captured on tape as a reminder to all future generations that this is what 110% smells like. A concert film like no other, This Is What 110% Smells Like features performances from acts such as The Stance, The Just Barelys, Old Man Luedecke, Brent Randall & His Pinecones, Windom Earle, The Maynards and of course Johnston. 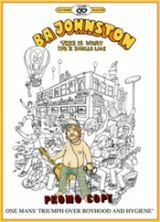 With commentary tracks and extras such as The BA Johnston Drinking Game, it’s an unforgettable document hosted by the man himself. Over the course of the past eight years, B.A. Johnston has released four albums while touring the country relentlessly. He currently lives with his mother in Hamilton, ON where he works as a fry cook. Bio: B.A. Johnston is a fat lazy chud who lives with his mother in Hamilton, Ontario. He only leaves the house to play shows, work as a fry cook, and to go on sporadic dates that his mom gets for him at her hair salon. He plays sad weird songs about deep frying, pirates, poutine and love on his trurty keyboards and guitar. He also has some cool dance moves and stuff. He has released 3 albums and has spent the last 8 years touring the country on the bus. He has shared the stage with acts like the rheostatics, the constantines, cuff the duke, the silverhearts, the guthries, joel plaskett and tons more, and has toured the country supporting immaculate machine, mayor mcca and falconhawk. He has played such high profile smooze fests like Halifax Pop. Close to the Coast (Charlottetown) and Ranchfest (Vancouver). He hopes one day to be rich and famous, buy a deep fryer for his room, and finally dance with a girl when Stairway to Heaven is the last song of the night.